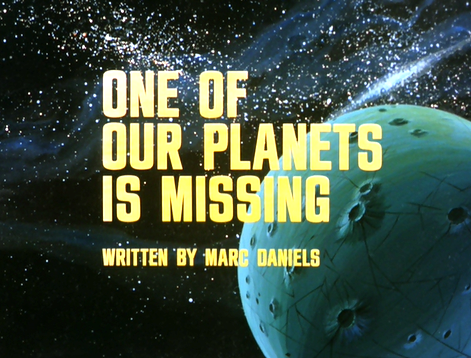 “One of Our Planets is Missing” by original series director Marc Daniels is another superb early episode of Filmation’s Star Trek: The Animated Series (1973 – 1974). 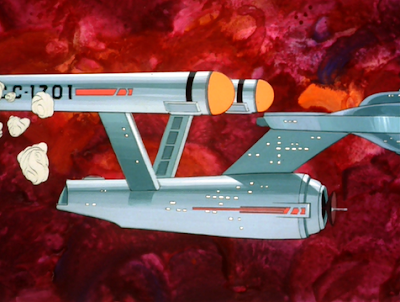 The episode is not only true to Star Trek’s spirit of adventure and decency in the face of dangerous alien contact, but forward-looking in its approach to its subject matter. The episode also maintains remarkable continuity with the established Trek universe. In “One of Our Planets is Missing” a “huge cosmic cloud” moves into the "outer fringe of the galaxy.” This cloud is a “strange combination of matter and energy” and quickly consumes an uninhabited planet. Worse, it is on a direct course for a world of eighty million colonists: Mantilles. Captain Kirk (William Shatner) orders the Enterprise to investigate, and takes the ship inside the strange cloud. Mr. Spock (Leonard Nimoy) and Dr. McCoy (De Forest Kelley) soon realize that the cloud is alive, and possibly intelligent. Spock likens the space-going organism to a “bull grazing in the pasture of the universe,” a bull who may be unaware that it is harming other life-forms. With only hours remaining before Mantilles is consumed by the cloud, Captain Kirk must consider destroying the organism’s brain, but Spock attempts a Vulcan “mind-touch” and contacts the alien being in hopes of reaching some kind of agreement. He allows the cloud entity to see life through his eyes, and recognize that it is destroying life-forms with its basic, biological behavior. The alien understands Spock’s message of peace and cooperation, and pledges to return to its “origin place” outside the galaxy. “One of Our Planets is Missing” charts the Enterprise’s encounter with a mysterious space cloud, a sort of scintillating alien rendezvous that would recur, with some variation, in films such as Star Trek: The Motion Picture (1979) and episodes such as Star Trek: Voyager’s “The Cloud.” Here, the cloud is not cloaking a vast life-form (as is the case in the first movie), but is an actual life-form unaware that its behavior may be interpreted as hostile. 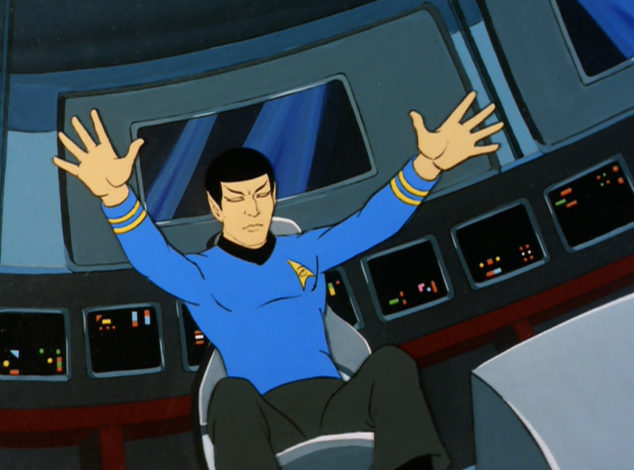 In "One of Our Planets is Missing," Spock uses the Vulcan mind-touch to give the cloud a sense of humanoid life, a development which recalls not only “Metamorphosis” (and Commissioner Hedford) but some moments in the third season Star Trek episode “Is There in Truth No Beauty?” Here, however, the entity in Spock’s body not only gets to “feel” and “touch” human life, but through a video presentation on a view screen, gazes at human life on Earth. It sees cities, children playing and other aspects of our existence. In terms of continuity, “One of Our Planets is Missing” is rather amazing, especially for a Saturday morning production in 1973. Kirk contacts the governor of Mantilles, Bob Wesley, a character seen in live-action in the second season episode “The Ultimate Computer.” We learn that Wesley left Starfleet for politics, and now lives on Mantilles with his eleven-year old daughter, Katie. This is a great character touch that connects the animated series to its live-action predecessor, and not in a gimmicky or exploitative way. 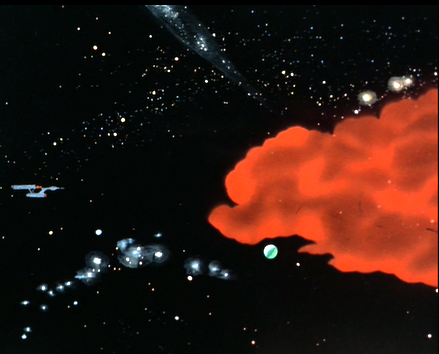 Also in “One of Our Planets is Missing,” Kirk grapples with the necessity of killing the cloud to save the population of Mantilles, and verbally references his speech from “A Taste of Armageddon” about deciding “not to kill…today.” It’s a deliberate call-back to a great (and under-appreciated episode), and also a good re-assertion of Kirk’s essential humanity. 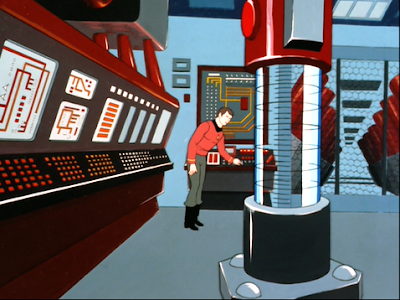 Scotty also gets a significant role in this episode, proving his worth once more as a “miracle worker.” Here, the engineer is able to capture one of the cloud’s villi (made of anti-matter) to regenerate the Enterprise’s failing engines. This seems strangely plausible in terms of previously established Trek tech. I haven’t watched “One of Our Planets is Missing” in many years, but I thoroughly enjoyed watching it this week, and felt that it honored the finest tradition of Star Trek. 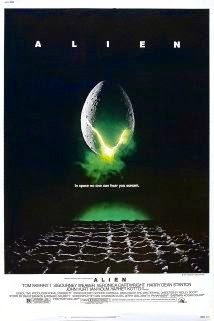 It’s the tale of a misunderstanding between alien races, and suggests that peace and friendship are possible once a dialogue begins, and if everyone -- over the odds, and without panic -- embraces good intentions. Next week: "The Lorelei Signal." John excellent review and more proof that Star Trek The Animated Series is worth watching. It is truly the final years of the original series five year mission. I was a young boy and saw this animated series first-run in 1973-74 on Saturday mornings. I would recommend that anyone that likes the original series 1966-69 should watch this animated series too. It is a logical conclusion.